Combine Lipton® Recipe Secrets® Onion Mushroom Soup Mix, water and tomato paste in a slow cooker. Add beef; toss to coat. 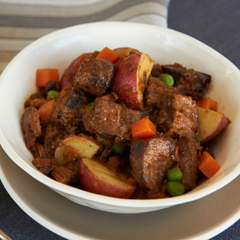 Arrange potatoes and vegetables on beef. Cook covered on LOW 8 to 10 hours or HIGH 4 to 6 hours or until beef is tender.